Barrel: 8.5" 4150V Chrome Moly vanadium steel, phosphate treated for durability and chambered in 300AAC Blackout with a 1 in 8" twist. Pistol-length gas barrel is finished off with a PSA 7" Lightweight M-lok Rail, a low profile gas block and an A2 flash hider. Bolt: Bolt is made of Mil-spec shot-peened Carpenter 158 steel. Gas key is secured with grade 8 fasteners and staked per mil-spec. Bolt carrier is phosphate coated. Build Kit: A high quality lower build kit with everything you need to assemble your AR-15 lower into a pistol. 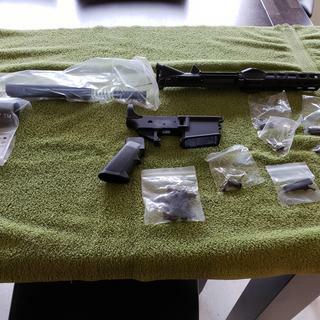 Pistol kit includes a Shockwave Blade pistol stabilizer, Shockwave tube, PSA classic A2 grip, USGI trigger guard, carbine buffer spring, and standard carbine buffer. Do you ever get tired of silly questions that could be answered by reading the description? This does come with a complete lower parts kit correct? All it needs is a striped lower? Will this set up work with subsonic ammunition? BEST ANSWER: Technically yes. It will fire subsonic ammo. 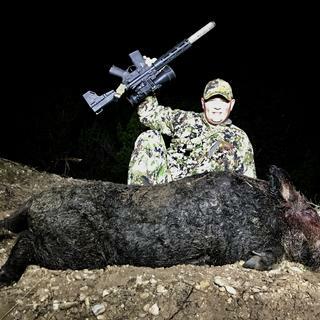 The 1 in 7 stabilizes subsonic 200gr plus projectiles better but this will work if you aren't worried about moa accuracy at any sort of distance. Will any stripped AR-15 lower, like the PSA AR-15 1728 lower, work with this kit? BEST ANSWER: Any AR lower will work. Lowers are NOT designated pistol or rifle. They just say multi caliber. Just make sure the lower carries the proper designation of a pistol lower. 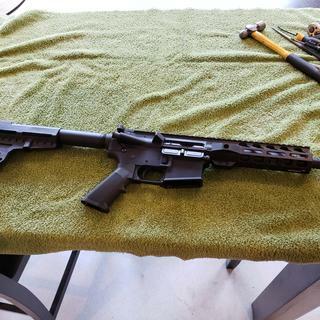 Remember you are building a pistol, so don’t use a rifle lower in that process. If you live in NYS and have your pistol permit can you have this shipped to your house? 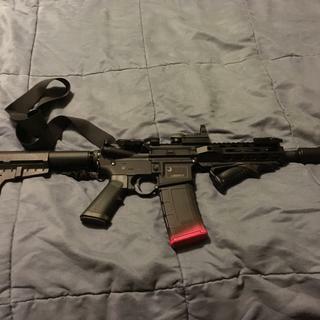 Can I change the lower pistol kit with a lower rifle and be legal? Does this include a bolt? Can you attach this kit to a standard AR-15 Lower unit? BEST ANSWER: Unknown, I purchased a PSA lower. For all intents and purposes I would assume it would. 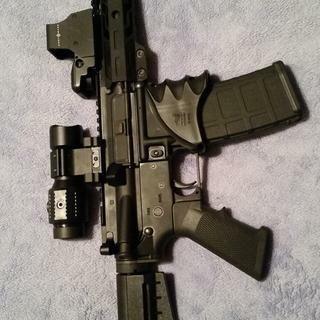 Can you change the handguard on this upper if you want to? BEST ANSWER: Yes, you can change out the handguard with any free-float handguard designed for the AR platform. This barrel configuration will not accept standard M4-style handguards. Does this come with the complete upper? BEST ANSWER: Yes, everything you need except for the lower receiver is included. I'm wanting to buy an upper in 300 AAC Blackout. What is the overall length when completed? 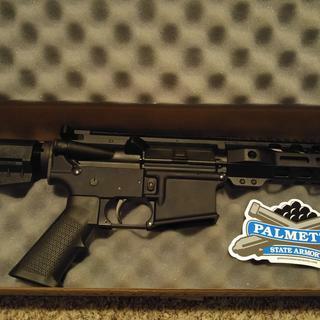 Can this kit be shipped to North Carolina without a FFL ? Normally, if a unit like this is out of stock, how long until you have more? Can this be shipped to my house in Florida? 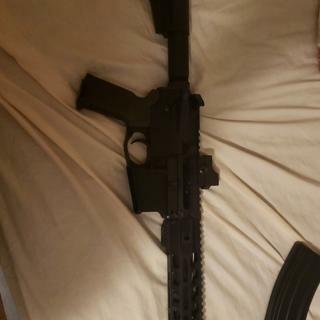 Got this on sale and put it on an Aero Precision lower. Fit perfectly. All parts went in like butter and function smoothly. 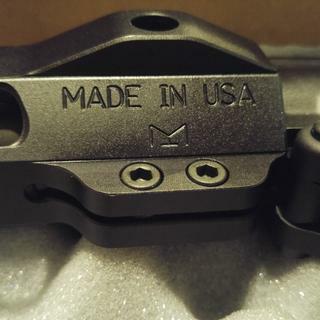 The machining is top notch, all parts nice and clean. The completed pistol feels substantial and good in the hand. The furniture is Magpul and really nice. FOR ANY PRICE, PSA deserves a second look from anyone wanting quality parts. Pay for a fancy name and for bragging rights. Or pay for what you want: a good looking, well-made, reliable firearm. PSA has a fanboy. They deserve it. Shipping was fast and I was glad it had an extra set of springs and detent pins. After completing the build, it shot good and looks amazing! 1st Blackout on the wall. "Its gerreeaat!" There are things that really surprised me about this build. Even thought its such a large projectile and short barrel there is less recoil than a normal rifle length 556, seems even less recoil than my 9mm sig. Target acquisition is almost instant after each pull of the trigger. The only draw back is the price of ammo and accuracy beyond 75+ yards. I will eventually try out a rifle length barrel and gas system for the blackout but as far as this 300 build kit goes, if you don't already have one and have the money for a new addition to you AR family order it today! If you do have one well then......buy another you know its worth it! The upper looks awesome, hand guard is finished nicely, and most importantly it goes bang every time. Highly recommend. The ONLY negative is slow processing and shipping times. Considering I’ve purchased several of your items this is the first problem I’ve ever come across. When assembling the lower, the safety selector switch it had massive burrs in it hindering it from going from safe to fire. It would continue to get stuck. I wasn’t about to hammer out the roll pins for a return so I ended up buying another LPK for other projects and to replace what I needed. What a hassle. 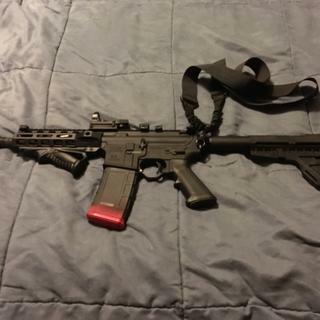 Awesome home defense weapon, I’ve put over 300 hundred rounds through it without a glitch. I recommend this package for anyone looking for a reliable self defense weapon at a great price! Love this package, I built a great home defense weapon at a very affordable price. I can’t believe how easy it was to build. Can’t beat it for the price. Shoots and runs awesome. Little pistol shoots under 1” with Hornady factory subsonic 190gr. Very happy with build kit. 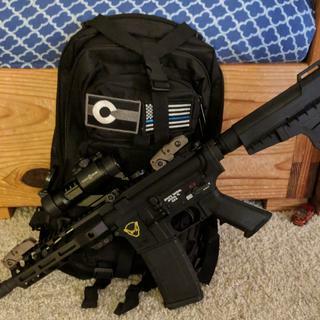 Got this kit and the psa lower. Matched up perfectly.This is a good looking pistol! Thank you psa! The quality of this kit was top notch. Shipping time was only a couple days. After building my lower and attaching this upper it was off to the range. After 100 rounds still runs great with no problems. Great price Great kit. Been wanting a 300 blackout in pistol length for a while. Went on sale and snapped this one up. Couldn’t be happier. Grab one for yourself!!! Can’t be happy with this build. Paired with an extra PSA I had. Went together with no problems. Excellent kit for the money!. Awesome kit. Came complete minus a stripped lower. Went together easy. Once together it function flawlessly with all types of ammo and bullet weights. Great for short people! Or for fitting in tight places! 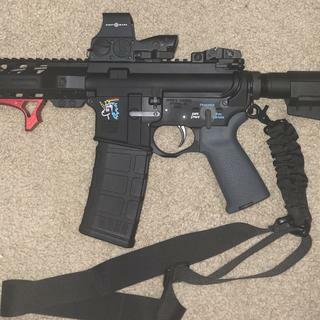 I love this AR pistol! 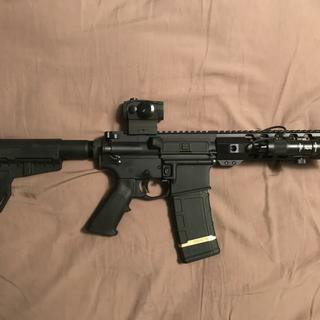 I'm a relatively small framed guy, full sized ARs never felt like a good fit. But this one is perfect, feels like an extension of my arms. I highly recommend buying one of these if a full size just feels a bit unweildy. It's my first experience with 300 Blackout, which just makes so much more sense then 556 out of such a short barrel. So far I love the round, just not the price per shot. But I imagine 300 ammo costs will continue to drop as they have been for several years. I am very impressed with the quality of parts from this kit. 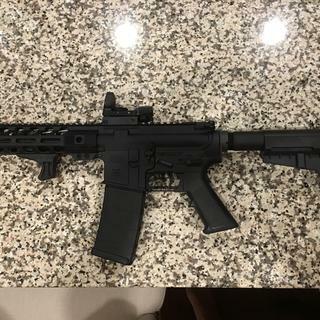 This is by far my favorite AR build and look forward to some range time with my new pistol. Thank you. sweet , go for it ! excellant product , Great service ! 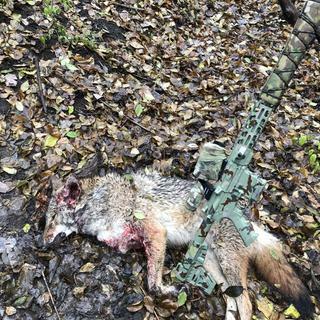 moa at 50 yds . 150grn fed store bought :-} will up date later. Just goes to prove quality is not all about the money spent. Nice finish nice Fit and the trigger is all so smooth. So far, I am impressed with the overall quality of components in this kit. 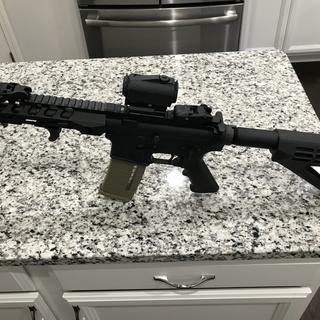 I put this together on a Palmetto State lower and it locks up nicely. I have been to the range twice and it functions flawlessly. Very happy with this purchase. Only issue for me was my kit was missing the take down pins, detents, and springs. CS was very helpful and I did receive the parts, but it took almost a month to receive them. Sub 1” groups at 100 yards with Hornady 190s. Several pigs have become victims of this handy little “pistol”. Went together great. Everything works as it should. Would buy again. Recommended to friends who bought one as well. Very impressed with this kit! I plan on buying another when back in stock. 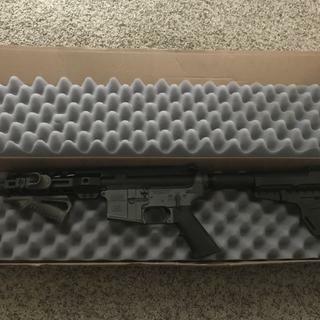 Great deal, fast shipping, awesome gun!! Awesome gun! As described, said it had blemishes, but couldn’t find any. Great buy and exactly what I was looking for. 300 blackout is the way to go, all u need is a stripped lower. Sighted this in today and am very happy. Easily shot minute of bad guy at 25 yrds. I was impressed by the trigger out of the box. I will replace the A2 grip since i hate it in every application.The only minor problem was the bolt release was sticky for the first few times. Great kit at an even better price. Very nice build kit. I like how the lower parts kit is broken down in their respective parts groups and even included an extra takedown detent & detent spring. Installed in my Anderson lower without any issue. Nice tight fit without any noticeable movement between the upper & lower. Handguard appears to have Midwest Industries markings, bonus. Just remember that because of the diameter of the pistol buffer tube, an open ended castle nut wrench is needed. For the price it can't be beat. Bought this on sale, took a little longer than expected to ship. 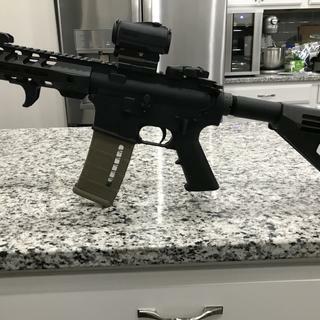 Put it together the day it arrived and headed to the range. No issues that I can detect - it's exactly what it says it is. Nice kit for the money. Will run any ammo you feed it.